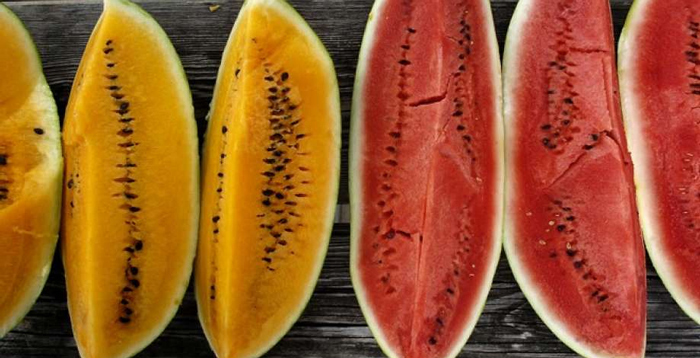 Yellow Watermelon vs Red Watermelon - What About Watermelon? Lazing by the pool during Summer, many of us indulge in juicy red watermelons. Did you know though, that not all watermelons are red? While we enjoy our slices of red watermelon, approximately 300 other species are growing around the world. Just like the differing varieties of grapes; green or purple, the two most common watermelon varieties are red and yellow. Red watermelons can be easily picked up at the local supermarket while yellow watermelons are slightly harder to come by. In this article, you’ll find a number of facts that will help you decide which of these two watermelon varieties is best for you. 1 Red or Yellow Watermelon? Seed Color: Black – Available in seedless varieties. Nutritional Note: Contains the antioxidant lycopene. When is Red Watermelon is Used? Everyday snack slices, ice-blocks and fruit salads. Taste: Similar to a red watermelon although sweeter. Subtle hints of honey. Nutritional Note: Contains the antioxidant beta carotene. When is Yellow Watermelon is Used? Creative cocktails, sorbet and to add color contrast to fruit salads. 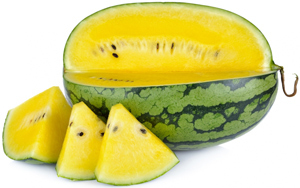 More about yellow watermelons can be found here. When choosing a whole watermelon from the local supermarket you can expect both red and yellow varieties to look very similar. The exterior color should be shades of light and dark green and it should appear smooth and glossy. The real differences between these watermelon varieties is apparent when they are cut in half and placed side by side. A red watermelon’s flesh should be deep red in color, while a yellow watermelon’s flesh appears canary yellow. While the majority of us have tasted red watermelon, only few of us have tried yellow watermelon. Those that have tried yellow watermelon, describe it as somewhat sweeter than the red species. Yellow watermelon is also said to have subtle hints of honey. Although these watermelon varieties are quite similar, due to the popularity of red watermelons, yellow watermelons are often hard to come by. Both watermelon varieties have high contents of water. 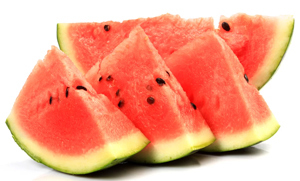 In fact, almost 92% of both watermelon varieties are made up of water. The common red watermelon is packed with vitamin A, B6 and C while the less common yellow watermelon contains vitamin A, C and a number of vitamins from the B group. The color of red watermelon is the result of high percentages of a phytonutrient, lycopene. Lycopene is solely responsible for the deep red color which is also the reason tomatoes are red. Prostate prevention and heart health in recent years have been linked to consuming lycopene. Yellow watermelons lack lycopene meaning that they do not sport a bright red color or contain these health benefits. Red watermelon also contains citrulline which is an amino acid that contributes to good blood flow. Citrulline is also said to prevent erectile dysfunction, although this is only when eating copious amounts. 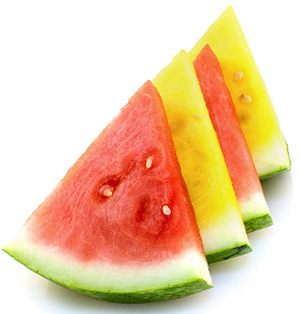 While yellow watermelons lack lycopene, they make up for this with their high mineral count. When biting into a yellow watermelon, you can be assured it contains magnesium, iron, calcium, phosphorus and potassium which all contribute to good heart health. Yellow watermelon is the better choice for those attempting to loose weight. On average, one cup of yellow watermelon contains just 46 calories.